They were both perfect and wrong in every way. Starry Eyed & Laughing inhabited that mid-70s post-Glam pre-Punk netherworld like strangers in a strange land. They cut their chops as part of the thriving pub rock scene of the day but singled themselves out with their amphetamine-paced blasts of '60s flavoured folk-pop - all 12-string Rickenbacker and 3-part harmonies. By the time their self-titled debut appeared on CBS in '75 they'd already honed their firebrand urban powerpop to distinction. 'Going Down' is without doubt the finest three minutes of pop music recorded in that gloomiest of pop years and I can only implore anyone who counts themselves as a pop fan to invest in a copy of this song forthwith. 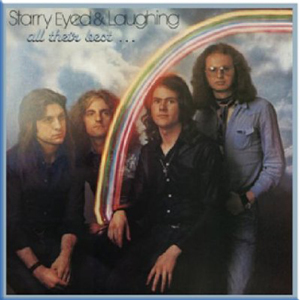 starry eyed and laughing were a beacon of light in a rather grey mid 70's rock scene. With a strong Byrdian influence they were nevertheless their own band and married the best elements of british rock music with west coast sunshine. I saw them live a number of times and got to meet them and they were nice guys who obviously believed in what they were doing. Listening to this cd compilation brings back to me what amazing musicians they were and how strong their material was. If you love the Byrds or the Jayhawks or R.E.M or any band of that type then you'll love SEAL too. do yourself a huge favour. buy this record. - Now Sold Out !